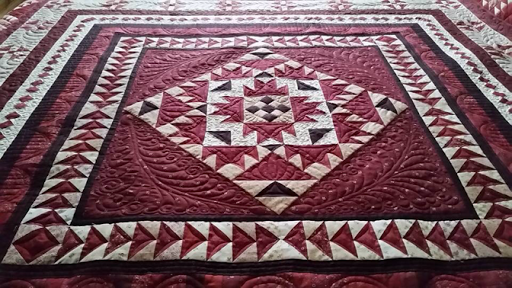 Back in February my number one Paducah customer sent me this one to custom quilt. Grant custom takes me a whole lot longer to work on but the end results are so worth it! Approximately 20 some hours on it...but when I laid it out it sang to me! Lalalalala!!!! This one will hang at BBQ & More at 123 Broadway, Paducah ky during the quilt show the end of this month. Make sure you stop into see it...it's so gorgeous! David does fabulous piecing and this is his work of art. 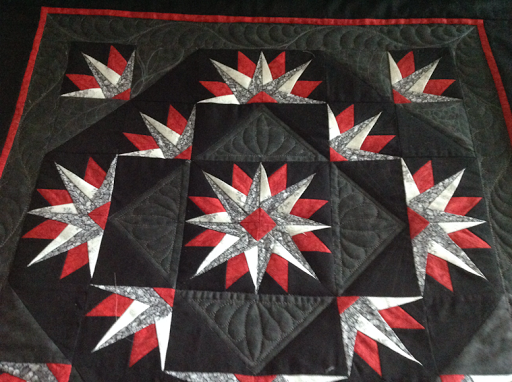 A friend from our Mayfield group asked me to custom quilt this wall hanging for a quilt show challenge. It was expertly paper pieced! Notice those super sharp points! I used my super favorite thread Glide. I swear Squiggy loves that thread! 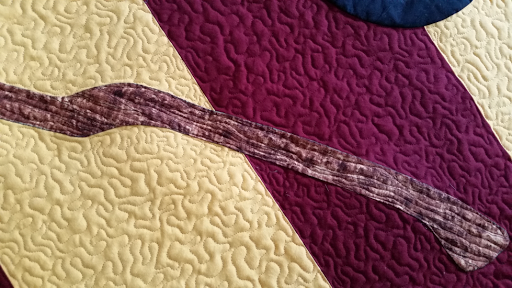 I love how the thread nestles into the quilt and shows every nook and cranny. 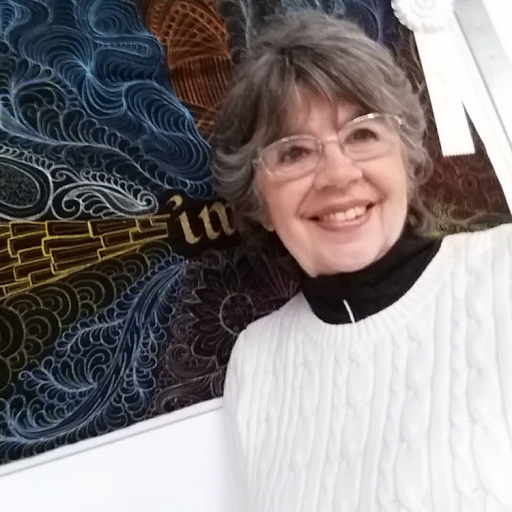 I'll get to see this one hanging up at Grand Rivers Quilt Show during the Paducah Quilt Show. 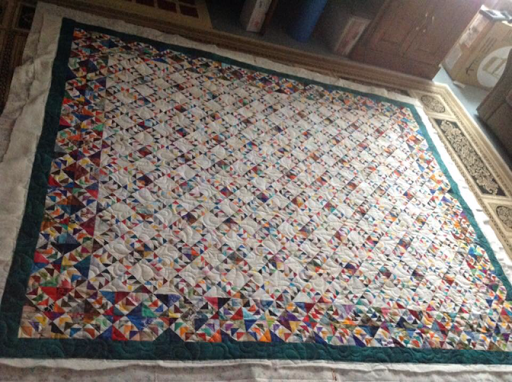 My super quilter friend from St Louis was volunteered to make her grandson's school a quilt to raffle off. And this is what she came up with. It was super amazing quilt! Love the Hufflepuff stripes! NICE TOUCH...the glasses and scar! The Quiditch broom and ball!! Like I said ..Amazing Rita!!! I loved working on it for you. From what I heard it was a big hit at the school to! Way to go lovely Rita...oh that another Brit song. 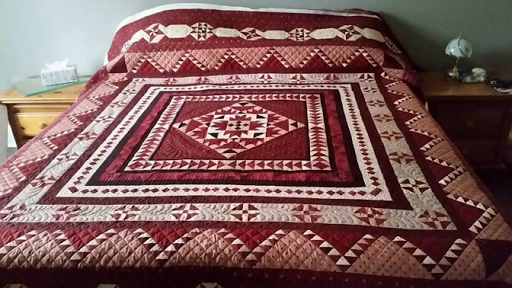 The last quilt I did in the garage was mine!!!! Shocking. 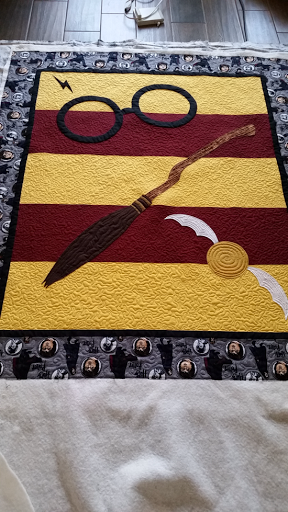 So the story behind this quilt I had taken it to a class. She would give us suggestions on how to quilt it. We got off on the wrong foot and she picked this quilt to shreds!! The final straw was when she told me I had UNDERPANTS in my quilt. I'm not saying where...most people don't have a clue. BUT I got no help what so ever. 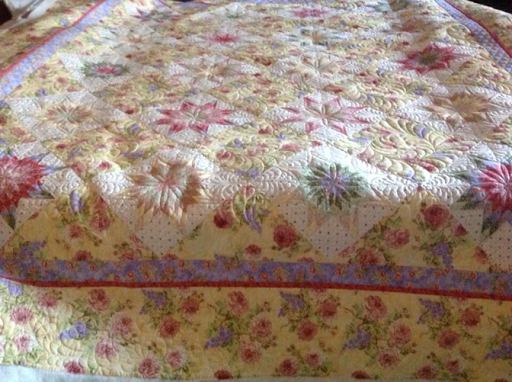 But a fellow quilt DID help me and once I started it I saw the potential! 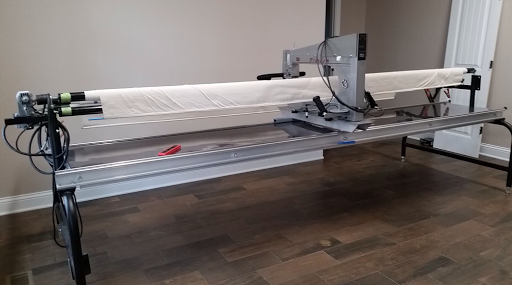 Midway into the quilting of said UP up and Away...UP is the abbreviation for UnderPants...Bill says he wants to move the long arm machine. So Squiggy was the first to move into our new house. And UP up and Away was the last quilt to be done in the garage and the first to be finished in the new house! 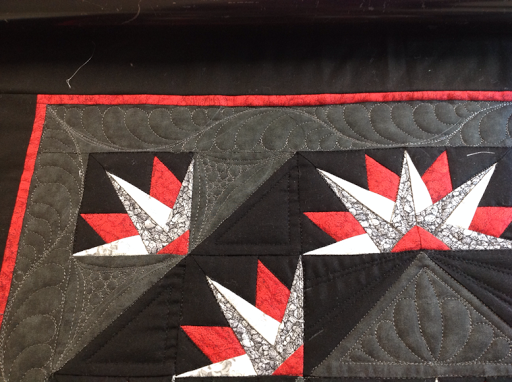 I'm now in a panic to finish the binding for it to hang in our Ice House quilt show in Mayfield KY for the month of April. I need to have it bound and labeled by Monday night. I always have worked well under pressure! And the answer I is no! Now no ..now to figure out this!!! To catch any of you up, last February we sold out house near the lake. We decided we didn't fit into a subdivision. We had a plan but needed to hurry it up. Decided to have a metal building built and we would live in that while the house was built. We have lived in the garage since May 9, 2016. Actually it worked out well. 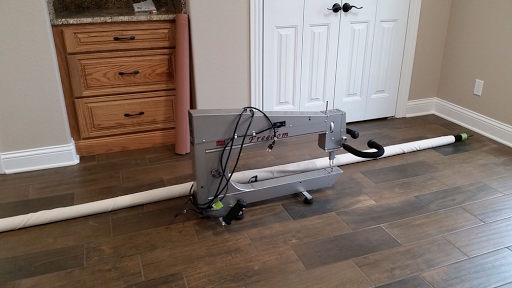 I have my long arm machine, some fabric and I was happy. BUT.... it's time! The house is almost complete and it is time to move in. First one to move in...Squiggy! 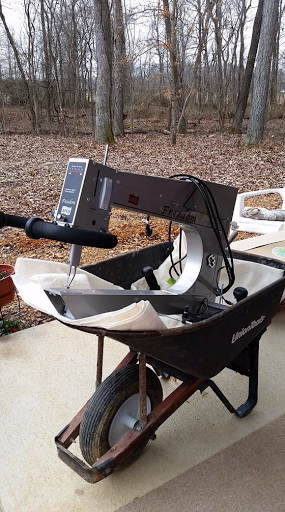 Here he is riding in his chariot.. for ok ok maybe not but he's stylin' in that wheelbarrow! Bill and I are are getting pretty darn good taking him apart and moving him and putting him back together. Took us a little more than an hour! and in his new room! Moved into place, a few minor adjustments, power on! And so with Squiggy all set up and our first full day of moving under our belt...I close up shop and look forward to another day of moving MORE BOXES!!! Everyone knows I'm an APQS super fan. Ok ok maybe the biggest fan! 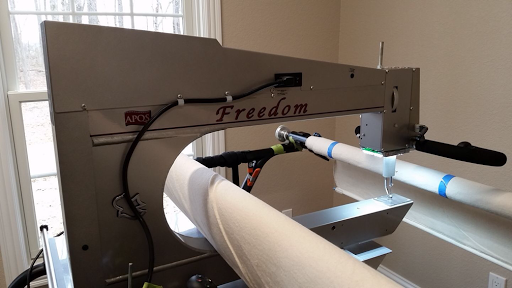 The APQS blog is featuring their family of owners who run small businesses. My great friend and APQS rep, Angela Huffman, contacted me a little bit ago and asked if I would be her Guinea Pig. Well, of course! She sent me a list of questions, which I answered and sent back. 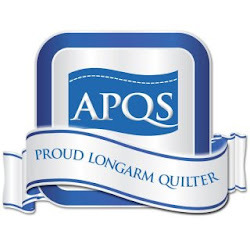 And I'm being featured in the APQS blog! On their FB page! And I'm on cloud 9!!! I really can't believe that this little no name from South Wales, NY, who spent most of her life as Bill's wife or Bill and Bob's mom has found a path to take. I'm sorry I found it so late in life, but I'm not going to waste a moment of this ride! 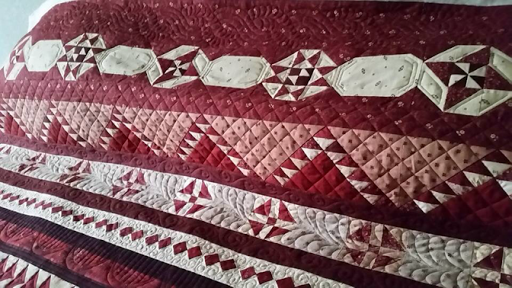 My quilting is my quiet time..it gives me strength to carry on to the goals I set for myself. 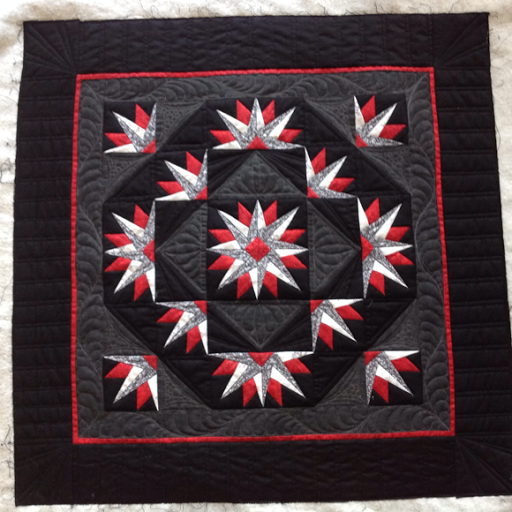 My quilting is my encouragement. 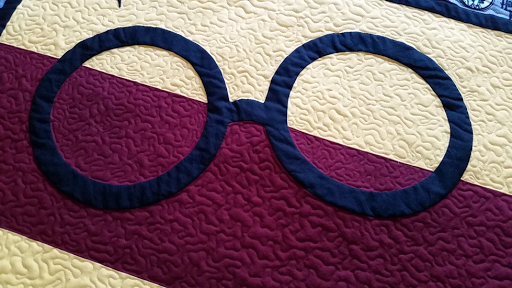 When I see what I can create on a quilting frame, I carry that enthusiasm to the other corners of my life. 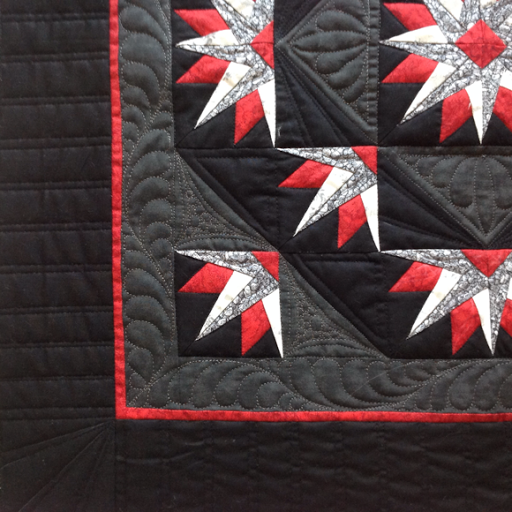 My quilting gives me joy. As I look down to my quilting the stitches they remind me where I started and where I am. 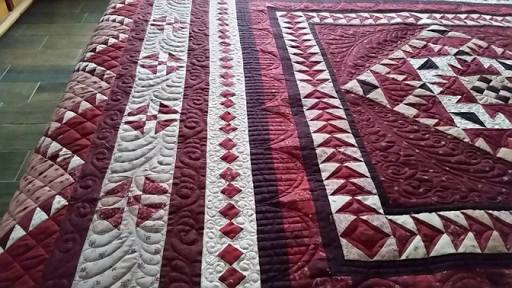 Never stop learning, never stop trying never stop believing in myself.. my quilting changes from day to day. It can be my Funtime, or my solice. Then again it challenges me! But mostly it is my satisfaction. I have to thank my list of customers, without them I'd have no UFOs ...I'd have time to quilt my own...lol just kidding I wouldn't change a thing. 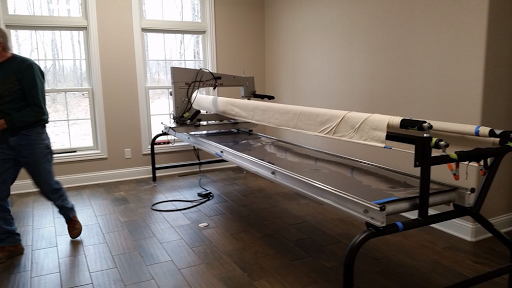 I'm looking forward to this new year, a new home (which Bill finally admitted my sewing room is too small!!!) and a list of new quilt! Thank you everyone, for being with me on this journey! So what have I been working on, thank you for asking! 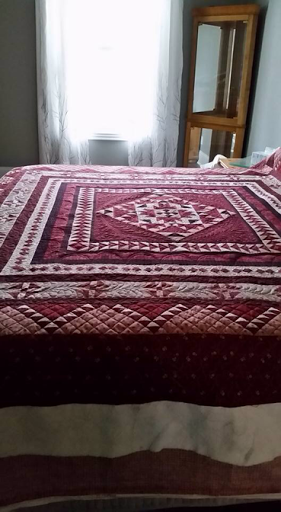 She sent me pictures of how she wanted it quilted. I think I nailed it! I sent her a few photos and she said she loves it! I used my go to batting, Hobbs Heirloom and my go to Glide thread. How I love Glide! Altogether I think I have about 16-18 hours. Seemed like it would go on forever but dang it was worth it! On to a friend from Alaska! Now if you go way WAY aback on this blog you'll find where Wanda and I met! She saw my blog, contacted me. I did a couple for her and returned them before her LQS had her others, that they had had for months, finished and returned. Lol dang I was good back then! We decided on a feather panto! Of course Heirloom and Glide combo. Thread is a creamy purple. Does that make sense? Can purple be creamy? Well it works here! 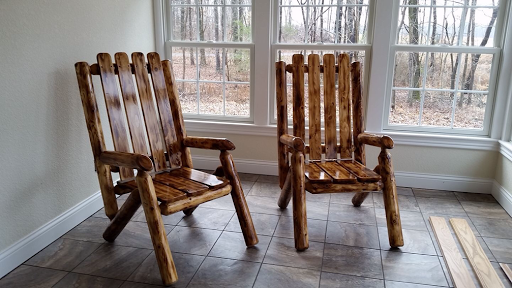 I have one more to do this week for Wanda and then I'll send them home. And just when you think I was done! While waiting for Wanda to reply I loaded Roxanne's and worked on that one yesterday. Youv probably heard of Bonnie Hunter. duh, who hasn't!! Well is her Wild and Goosy pattern. Roxanne is a far better person than me!! 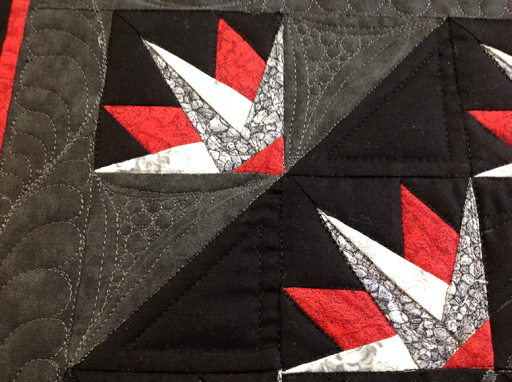 These flying geese patterns finish to about 1x1.5". No clue how many she has in this one...should I count them? Naaa! 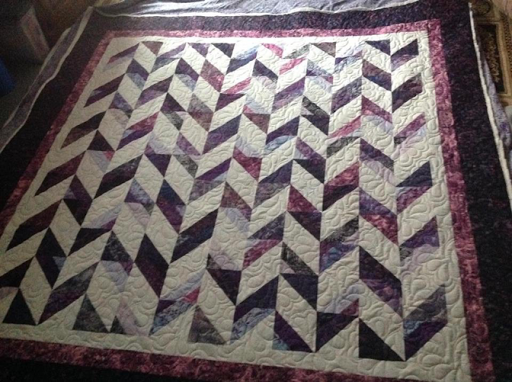 I'll quilt it but I'll never make it! Yes Heirloom and Glide. But she decided on her stand by gold thread. Mind you not dark gold, nor light gold...but a rich medium gold. I think it's a GOLDielocks and 3 bears thing...lol Roxanne requested something curvy. This panto called Adaigo filled the bill. It's curvy, looks like feathers. Looks like curling waves of gold! It's beautiful! Ok, I'm done! Will load another one tomorrow. Should have done it today but I was busy uploading pictures to google pictures...in a way I do miss the old photos! But what would I need them for in years to come! I look at old photos and think..now who made that one???? Thanks for joining in...have a great night!